The Orange Bird is a character created by Disney for the Florida Citrus Commission as a mascot and has been a prominently featured character in Magic Kingdom's Adventureland at the Sunshine Tree Terrace located near Walt Disney's Enchanted Tiki Room. 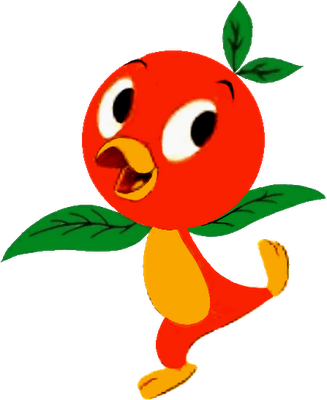 The Orange Bird was created in 1970 as a mascot for the Florida Citrus Commission in exchange for them sponsoring the Tiki Room attraction at Magic Kingdom. Accompanied by singer Anita Bryant, the two appeared in ads for Florida oranges and Bryant narrated a record album telling the character's story. After the Anita Bryant ad campaign was dropped in the late 70s, the Orange Bird had a solo career and appeared in a few educational shorts in the 1980s such as Foods and Fun: A Nutrition Adventure and The Orange Bird and the Nutrition Bandwagon. Eventually, the bird would fade into obscurity when Disney and the FCC severed their ties in 1987. Eventually, on April 17, 2012, the Orange Bird made a proper return to the Sunshine Tree Terrace. Take a break from cult Disney characters and enjoy some science. Where is the Orange Bird now?